A List Apart recently linked to an article by Joshua Seiden titled, “Designers shouldn’t code” is the wrong answer to the right question. Joshua’s article is actually a response to Wayne Greenwood’s article, Unicorn, Shmunicorn—Be a Pegasus. Both authors discuss important topics like different methods of approaching problems, which details to focus on & job security, so I urge you to read them. But to be completely honest (and hopefully not belittling), I think we’re over thinking this. Designers should know just enough code so that they understand the technical constraints of a project and are able to reduce any potential issues during the execution phase. In this case we’re definitely talking about front-end code, as Joshua goes on to say. I can’t think of any valid reason a designer should have to worry things about frameworks, database adapters, frameworks, etc. What does it mean to be a t-shaped person? Basically, it’s someone who excels in one area, while still being generally knowledgeable in other related areas. Having a general understanding in the areas listed above doesn’t mean you need to become an expert in them. I can also guarantee you that you won’t have to design in the browser, understand Sass mixins or know the difference between a rebase or merge in Git. Heck, most of the time you probably won’t even have to write code. Developers don’t want designers to start writing production-ready code, the same way designers don’t want developers to create interfaces. There will always be a need for a dedicated designer and no one is trying to diminish your role on the team. Things move quickly in the web industry and that means constantly learning new things and stepping up our game. Don’t look at these extra responsibilities as burdens, instead see them as a new challenge. Ruby on Rails is a great framework with lots to offer, but to those unfamiliar with either Ruby or Rails, it can be a bit intimidating to get a development environment set up. Note: I’ll only be covering installation for Mac OS X (specifically Lion) because that’s what I’m using. Windows users should have a look at RailsInstaller and Linux users probably don’t need help anyways. There are lots of ways to set up a Rails environment, but I’m only going to cover my preferred configuration, which is using rbenv and ruby-build. That title doesn’t lie - installing rbenv is pretty simple, but you will need to have Git on your system. If you don’t have it yet, you can download and install the Mac package from the official website. If you’re unfamiliar with shell commands, all we did was change into our home directory (/Users/yourusername) and cloned a Git repository into a new directory called .rbenv (in OS X any files/folders that begin with a period are hidden by default). Next, enter the following command into Terminal and you should see a help screen with the version of rbenv and all the possible commands. If you don’t get an error that means you’ve done everything correctly - congrats! Now we have rbenv set up, but we still need to install a few more things. If you thought installing rbenv was easy, then you’ll love ruby-build, which by the way, are both of which are made by the super awesome Sam Stephenson of 37signals. The above commands created a subdirectory called plugins in /Users/yourusername/.rbenv, changed into that newly created directory and cloned the Git repo containing ruby-build. You can check ~/.rbenv/plugins to check and see if there’s a ruby-build directory there. If there is, it’s successfully installed. Now that we have both rbenv and ruby-build set up and properly working, all we have to do is install the latest stable version of Ruby and set it as the default version. We’re almost done - just a few more steps and you can start using Rails. It’s worth noting that the above commands will also allow you to install any other versions of Ruby (old or new), simply by changing the build number. Then you could have the latest Ruby version set as your system default, but override it on a per project basis using the rbenv local command. Since we’ll be installing Rails from the RubyGems library, we want to make sure that we have the latest version. RubyGems should already be installed by default, so all we’ll have to do is make sure it’s up to date. Once that’s finished updating, we’ll need to install the Rails gem. Rails and RubyGems are now installed and up-to-date. Our shiny new Ruby on Rails development environment should now be set up, properly configured and ready to start using. By choosing the rbenv/ruby-build configuration, we’ve made it pretty easy for ourselves to stay up-to-date with the latest version of Ruby. We also now have the ability to support legacy Rails apps that may require older versions of Ruby (like 1.8). If you’re wondering what to do next, you may want to read my previous article on Getting started with Ruby on Rails. Also, if you’ve run into any into problems during the installation process, I’ll try my best to answer any questions you may have on Twitter. Over the past few months I’ve been teaching myself Ruby on Rails. I’m very happy with the progress I’ve made and thought it would be helpful if I shared a bit of my learning process with others. I can write some PHP and understand even more, but it’s never really felt natural to me. It always seems that what I’m trying to express in my head makes more sense than the code I write. This left me looking for a different programming language, one that more closely matched how I solved problems in my head. So, why Ruby on Rails? There are many things to love about both Ruby and Rails, but the one thing that stood out to me was the Ruby language itself - it’s absolutely beautiful. Ruby doesn’t heavily rely on things like curly braces and semicolons, instead line breaks and indentation are used. As a result you end up with groups of code that look like statements written in plain English. Ruby is quite often compared to poetry because of this. And since formatting is so important, Ruby code will look virtually the same, even if it’s written by different people. This makes it much easier to read if you’re working with a team of developers or contributing to open source projects. I honestly don’t think it matters where you start. A lot of people will tell you how to learn, when really, only you will know best. The important thing is that you just get started and stick with it. I use a lot of different resources, both free and paid, but I had my “A-ha!” moment when I did the Rails for Zombies course. A free online course put out by Code School where you write code directly in the browser. This lets you learn Rails without having to set up a development environment on your machine. Basically, you watch a video walkthrough and then write code in your browser to reach the next level. Also, be sure to check out Rails For Zombies 2 and also Rails Testing For Zombies. A tutorial (recently updated for Rails 3.2) that will walk you through the creation of a simple Twitter-like app. You’ll learn about Rails MVC, testing with RSpec, user authentication, the Asset pipeline and even deploying to Heroku. You can currently read it for free online, or buy the PDF & screencasts. A great site with new screencasts each week (one free, one pro and one revised). All sorts of topics are covered such as customizing/optimizing Rails, working with Gems and refactoring your code. Also, if you buy a subscription then you get access to all the pro and revised screencasts. This is probably the best Rails book out there. It covers tons of useful stuff like testing, AJAX, authentication, sending mail and deploying apps. It’s also written by very talented people, including David Heinemeier Hansson, the guy who created Rails. This will be your best friend when you’re first getting started and can’t remember how to do something. I can’t tell you how many times I refer to this when I’m working with Rails. If you take anything away from this article, make sure it’s this section. These may seem obvious to some of you, but a list like this would’ve made my life a lot easier when I was starting out. It can seem daunting at first, but it’s very powerful and faster than browsing your filesystem. I put this off and did things the hard way for a while. It’s totally possible, but can be tedious. I prefer something like Textmate (or Sublime Text 2) because it lets me see the entire directory structure which can be helpful when you’re starting out. A lot of developers swear by Vim because they’re in the command line anyways and it’s one less app to switch between. Either way, make sure you love it because you’ll be spending 90% of your time using it. You’ll be way ahead of the game if you’ve worked with other MVC frameworks in the past. If you write procedural code, start with learning the basics of MVC. Simply knowing where all the code lives can be helpful when things go wrong and you need to debug. Rails isn’t a language, it’s a framework built with Ruby. That means you’re going to be writing Ruby, so learn it sooner rather than later. It will also give you a better understanding of how Rails works. One thing I didn’t cover here was setting up a Ruby on Rails environment of your own. This looks and sounds harder than it actually is, but it can be intimidating to tackle on your own. I should be publishing an article on that in the next few weeks, so stay tuned and start hacking. I’ve wanted to get this site back up and running for a few years now. It’s taken this long because I honestly wasn’t sure what the purpose of a new website would be, or if I even needed one at all. The previous version of this website first appeared around the beginning of 2007, right after I graduated from college. The whole purpose of the website was to showcase my graphic design work, try to land a few freelancing gigs and blog about graphic and web design. The website achieved all of those things, but it was quite obvious that the blog was an afterthought. I probably wrote about a dozen articles or so, none of which were spectacular or really said anything unique. The problem, was that I had originally decided to start blogging because a lot of other web designers were at the time. What I didn’t realize then was that I wasn’t contributing anything useful to the web and was just creating noise where it wasn’t needed. I ended up taking the site down in early 2009 when I was hired by Barking Dog Studios as a front-end designer. The blog had been neglected for quite a while and the rest of the site wouldn’t be needed anymore, so I replaced it with a “coming soon” page (which was actually still online up until a few weeks ago). When I first started redesigning, I was too caught up with what the rest of the web was doing. I was adding features I didn’t need, trying to go after a certain “look” and using shiny new technologies just because they were available. I went through a number of designs and even got to the coding stage a few times before completely scrapping them. It took me a while to realize that all of that stuff didn’t matter to me. I wanted my website to be a place where I could write about the things I love and share things that interest me with like-minded people. Once I knew what the purpose of the website would be, it wasn’t so hard coming up with an appropriate design for it. It’s far from perfect but I’m quite happy with the result so far. First things first – no promises. I’m not going to tell you that I’ll write a certain number of entries per month or anything like that. I’ll write when I have something to say. It could be an idea, a review, a suggestion or even a frustration (hopefully not too often). I imagine that most of it will be web or technology-related, but don’t hold me to it. Also, this website is very much a work in progress. I wanted to launch it as soon as possible so that I could start writing, but that also meant I had to leave some things behind (for now at least). This included a fluid grid layout and also support for media queries so that the site will be more usable. Hopefully those features will be added back in the near future. Also, this site will never have comments, but if you ever have questions or thoughts you can reach me on Twitter @matthalliday. 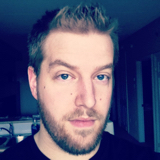 Matt Halliday is a Front End Developer at Shopify Plus in Waterloo, Ontario, Canada. © 2018 Matt Halliday. Powered by Jekyll, Github, and lots of coffee.